New good school places in areas where they are needed most will give more children from all backgrounds the world-class education they deserve, under plans announced today by Education Secretary Damian Hinds. • fresh agreement with the independent schools sector to help improve outcomes for pupils of all backgrounds. Today’s moves will build on the hard work of teachers and the success of the government’s reforms, creating 825,000 new school places since 2010 with 1.9 million more children now in good or outstanding schools. "Children only get one chance at an education and they deserve the best, wherever they live and whatever their background. Standards are rising in our schools and we’ve created hundreds of thousands of new places since 2010 but we want to make sure every family can access a good school. "By creating new schools where they are needed most and helping all great schools to grow, we can give parents greater choice in looking at schools that are right for their family – and give children of all backgrounds access to a world-class education." Today’s announcements follow the Schools that Work for Everyone consultation, which set out the government’s ambition to ensure there is a good school place for every child, whatever their background. The measures will create more places across the diverse school system, giving families greater choice and raising standards for pupils. This latest applications round will target areas where there is a demand for places and a need to help raise school standards, giving more families access to a good school place. Nearly 400 free schools are open. The government is launching the Selective Schools Expansion Fund, with £50million available for 2018-19 so that existing selective schools can expand their premises to create more places. This will give parents greater choice and give more children, from all backgrounds, access to a good school place. Schools will have to submit a Fair Access and Partnership Plan setting out what action they will take to increase admissions of disadvantaged pupils. Research shows pupils from disadvantaged backgrounds attain better results in selective schools and around 60% of these schools already prioritise these children in their admissions. For example, King Edward VI in Birmingham actively encourage more pupils from less privileged backgrounds to join their schools, including considering 11+ results for disadvantaged pupils separately to their non-disadvantaged counterparts. A Memorandum of Understanding with the Grammar School Heads’ Association has also been unveiled, outlining its commitment to widen access and work with local schools to raise standards for all children. There are many good or outstanding faith schools and more want to open. The Government will retain the 50% cap on faith admissions for free schools but will develop a scheme to help create new voluntary-aided (VA) schools for faith and other providers to meet local demand, supported by capital funding. The VA route already allows for schools to apply to open with up to 100% faith based admissions. The Department will work with local authorities to create these schools where they are needed, subject to a 10% contribution from the provider to the capital costs. To support the measures to promote social cohesion announced in the Integrated Communities strategy, these schools – as all schools do – will continue to be expected to play an active role in their communities. This could include twinning with other schools and ensuring diversity on the governing board. Examples of schools already doing this include St Joseph’s Catholic Junior School in Leyton, which has a strong record of working with local Muslim, Jewish, Christian and non-faith schools. Following the Schools that Work for Everyone consultation, we have established a dedicated unit that works with universities and independent schools to develop and strengthen partnerships with state schools to help raise attainment and aspiration for all pupils. A number of institutions have already come forward to do this including independent and state schools working together to support school improvement. 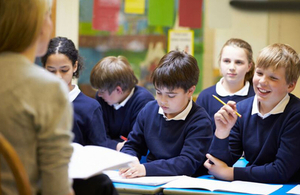 The Department for Education has today published a Joint Understanding with the Independent Schools Council, setting out how it will work in partnership with state schools and, in particular, help pupils from disadvantaged backgrounds. The higher education sector is also supporting these objectives and, in February, the Office for Students set out what is expected of universities with regard to participation and access. • More than £45million awarded to successful multi-academy trusts to help tackle underperformance and improve schools in areas that lack capacity, particularly in disadvantaged areas of the country. "We are very pleased that, like other good and outstanding schools, selective schools now have access to a fund to allow them to expand their premises. This is particularly important at a time when there are increasing numbers of pupils reaching secondary age and such high demand from parents for selective school places. "We look forward to working with the Department for Education through the Memorandum of Understanding, to continue and further extend the work that member schools have undertaken in recent years, to increase access for disadvantaged pupils and to support other schools to raise standards for all children." "The new wave of free schools announced today is fantastic news for communities across the country. Already hundreds of towns and tens of thousands of families have benefitted from the addition of great new schools to our system, and the next wave, targeted at areas that haven’t yet had this, will ensure the benefits are felt wider still."